Members of the subfamily Papilionoideae have true papilionaceous flowers in which the upper petal is outside the lateral petals in the bud. 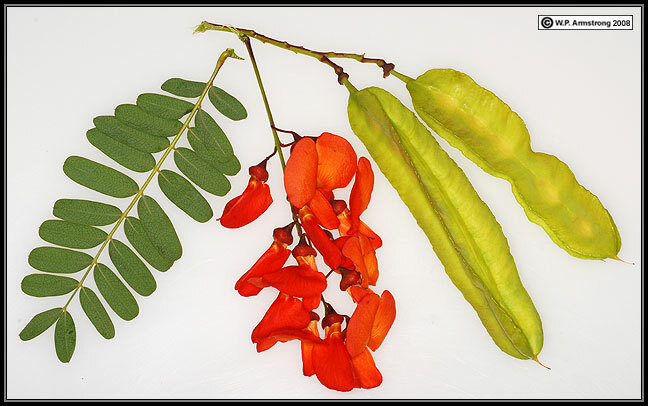 This subfamily includes most members of the Fabaceae with typical pea-like flowers, including Dalea (smoke tree), Lupinus (lupine), Lathyrus (sweet pea), Erythrina (coral tree), Robinia (black locust) and Astragalus (locoweed). A dissected papilionaceous flower of Erythrina crista-galli showing all the major perianth segments removed from their attachment inside the calyx. The five petals consist of one large, oval banner or standard, two elongate keel petals that are fused together enclosing the stamens, and two reduced wings. Nine stamen filaments are united into a sheath that surrounds the pistil. One stamen filament is separate from the fused nine, a condition referred to as diadelphous. A drop of nectar is secreted at the base of the petals inside the calyx. 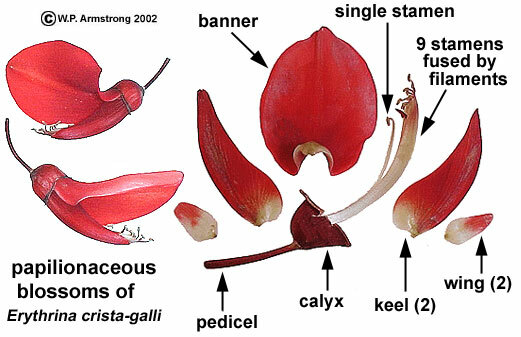 At maturity the banner is widely separated from the keel petals, thus making the nectar fluid at the base of the petals (within the calyx) readily available to short-billed perching birds. 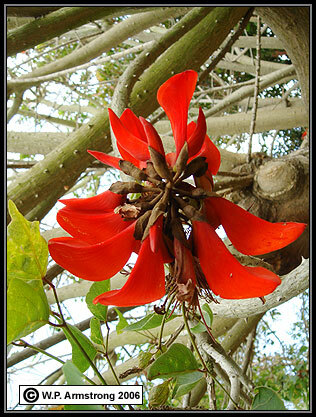 Erythrina species pollinated by hummingbirds have elongate, tubular blossoms. 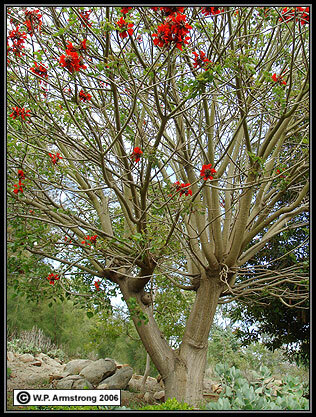 Kafferboom (Erythrina caffra), a large, thorny coral tree up to 70 feet tall (21 m) native to coastal forests and streams of the eastern Cape region of South Africa. 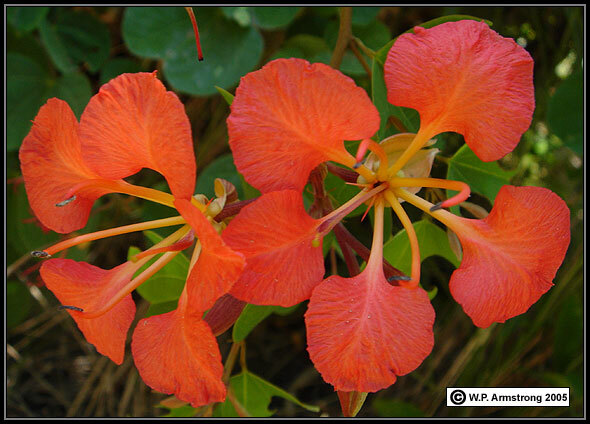 Like other species of Erythrina, the leaves are trifoliate with three separate leaflets. The flowers are shorter and broader than other species of coral trees, and they have widely separated (gaping) petals and conspicuous exerted stamens. Unlike the narrow, tubular, hummingbird flowers of New World coral trees, the kafferboom is pollinated by perching birds (passerines). The pods are long and slender with several bright red seeds. In South Africa, native people string the seeds into colorful necklaces. Children also collect the seeds which are known locally as "lucky beans." This beautiful flowering tree is commonly cultivated in San Diego County. seeds in the above photo were collected at the Palomar College arboretum. 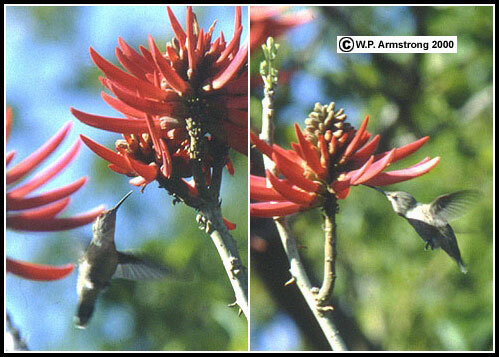 A hummingbird sipping sugary nectar from the tubular flowers of the Mexican coral tree (Erythrina coralloides) in the Palomar College Arboretum. As the hummingbird feeds, pollen adheres to its head and bill is transferred from one flower to another. If the pollen is transferred between flowers of different trees, then cross pollination is accomplished. The tree supplies the hummingbird with sucrose-rich nectar for this valuable pollination service. The South American tipu tree (Tipuana tipu). Unlike the fruits of most members of the legume family, the unusual fruits have a distinctive wing that causes the legume to spin as it falls from the rain forest canopy. The tipu tree is commonly planted as a shade tree along streets in San Diego County. In fact, it lines the major thoroughfares at California State University, San Marcos. 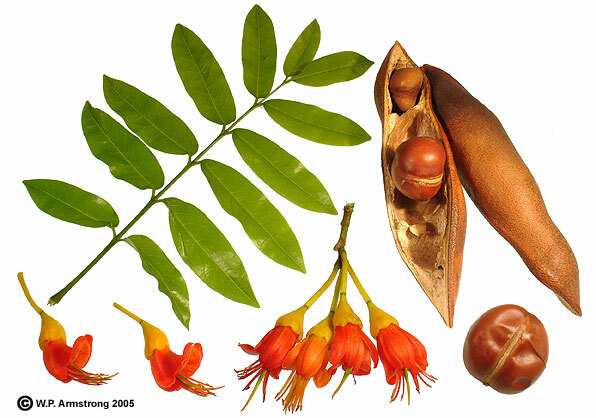 Moreton Bay chestnut (Castanospermum australe), a beautiful rain forest tree native to northeastern Australia and New Caledonia. 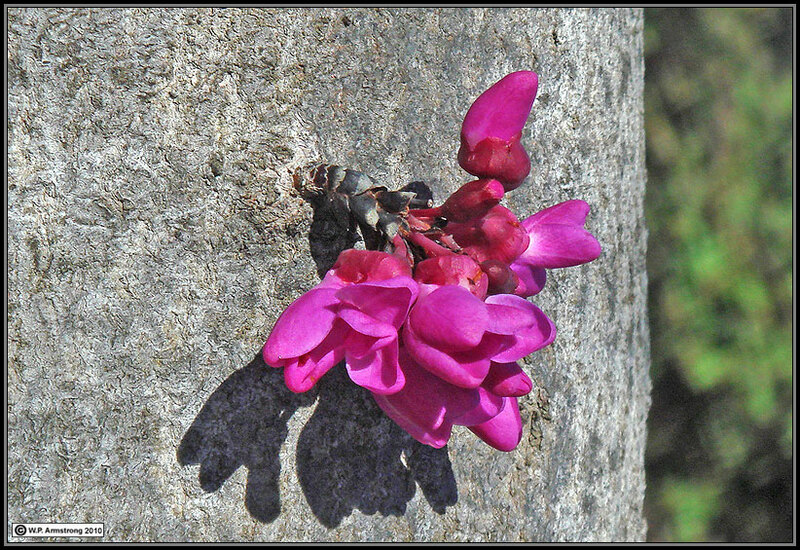 The North American redbud (Cercis canadensis) is a beautiful cauliflorous legume in the eastern United States. It is replaced in California, Arizona and Utah by the western redbud (C. occidentalis). The flower cluster in photo is coming directly out of the main trunk. Scarlet wisteria tree (Sesbania punicea) native to Southern Brazil, northeastern Argentina and Uruguay. In some references it is listed as Daubentonia tripetii. It is considered a serious weed in South Africa and has apparently escaped from cultivation in the delta region of California's Central Valley. Members of the subfamily Caesalpinioideae have flowers that are bilateral, typically with five distinct petals, upper petal (banner) enveloped in the bud by the lateral wings. 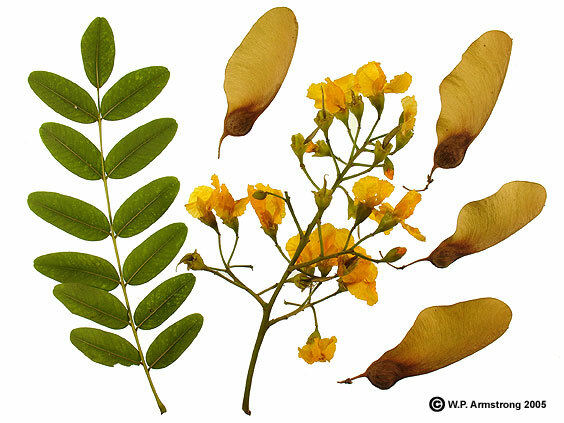 This subfamily includes Cassia (senna), Cercis (redbud), Bauhinia (orchid tree), Cercidium (palo verde), Parkinsonia (Jerusalem thorn), Caesalpinia (brazilwood), Haematoxylum (logwood), Ceratonia (carob), Tamarindus (tamarind) and Delonix (royal poinciana). Bauhinia galpinii, a shrubby species native to South Africa. The beautiful blossoms are brick red to orange. Although it is truly a legume, the flower is not papilionaceous. The upper petal is enveloped in the bud by the lateral wings. The pod of Bauhinia galpinii splits into two sections. When the sections twist (white arrow) during dry weather, the seeds are ejected with considerable force. They bounce off the leaves of nearby palm trees. Other legumes, such as Wisteria, also exhibit mechanical dispersal. 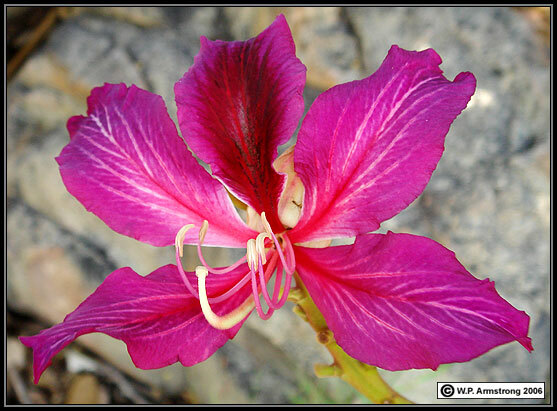 Orchid tree (Bauhinia purpurea), a beautiful tree native to India and China. It belongs to the subfamily Caesalpinioideae, and the flower resembles an orchid more than a pea. 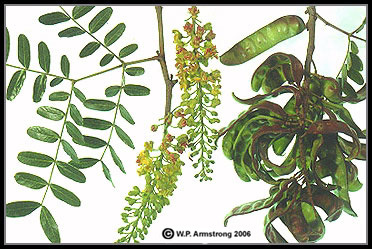 Compound leaf, flower clusters and seed pods of a South American species of Caesalpinia. This small tree on the Palomar College campus was previously identified as brazilwood (C. echinata), but my current conclusion is that it is tara (C. spinosa). The yellow flowers have five spreading petals typical of the subfamily Caesalpinioideae, unlike the pealike blossoms of most other legumes in the large subfamily Papilionoideae. The ground pods of tara are a source of tannins, and it is cultivated in Peru and northern Africa. The tannins are used for tanning high grade leather and for making a black dye used in inks. Tara gum comes from the endosperm of ground seeds. Like guar gum and locust bean gum, it is used as a thickening agent and emulsifier for many food products. The flowers and foliage are similar to brazilwood; however, its shrubby growth form with multiple trunks without dark heartwood suggests that it is C. spinosa. In addition, its naturalized growth in the arid hillsides of the Palomar College Arboretum is indicative of C. spinosa rather than C. echinata. The heartwood of brazilwood is very dark and distinct like logwood (Haematoxylum campechianum). 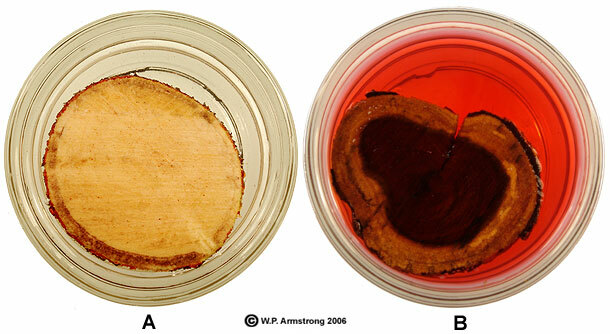 In fact, the heartwood of both species produce two bright red dyes (see below). The trunks of tara do not have dark heartwood. A. Stem cross section of tara (Caesalpinia spinosa) submersed in water. There is no visible dark heartwood as in brazilwood (C. echinata) and no dissolved dye. Tara wood is very hard and sinks in water. It has a specific gravity greater than 1.0. B. Stem of logwood (Haematoxylum campechianum) submersed in water. A red phenolic dye (hematoxylin) from the heartwood has dissolved in the water. Brazilwood has a similar red dye called brazilin. 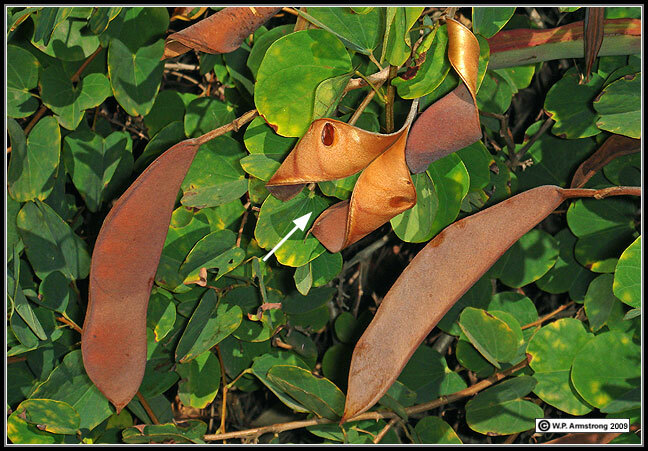 One of the most distinctive traits that separate brazilwood from tara is the seed pod. The flattened pods of brazilwood are oval (oblique) and spiny. They are dehiscent and contain only 2 or 3 seeds. 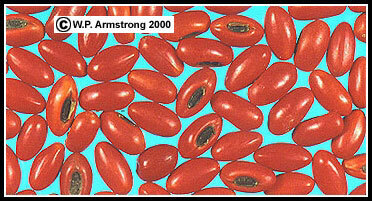 The reddish-tinged, indehiscent pods of tara are smooth and elongate with more than 3 seeds. Compare the pod of brazilwood (left) with pods of tara in the above image. A. Freshly cut trunk of tara (Caesalpinia spinosa) showing the absense of dark heartwood. 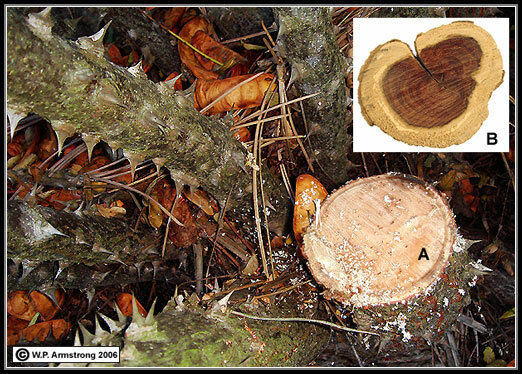 The multiple trunks are covered with sharp, woody thorns. B. Cross section of a branch from logwood (Haematoxylum campechianum). Both logwood and brazilwood (C. echinata) have a distinct dark heartwood that yields a bright red, water-soluble dye. The heartwood of brazilwood (pau-brazil) has been used in the making of violin bows for more than two centuries and is known to bowmakers and musicians as pernambuco wood. See: Rymer, R. 2004. "Saving the Music Tree." Smithsonian 35 (1): 52-63.